The District has had a hard time getting cooperation from two churches near its Piedmont Elementary site. More homes are planned for acquisition now than have been previously reported. This is the Story one businessman tells. 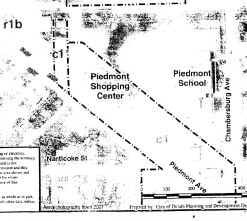 The School District showed this map to the Duluth Zoning Appeals Board asking for the vacation of streets next to Piedmont Elementary School. 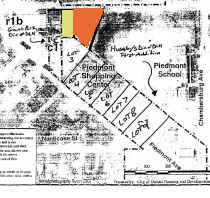 According to this map the District owns all the property above the large cigar shaped property running parallel to Piedmont Avenue and at an angle on the map. This is the corrected map which Businessman Scott Kuiti showed the Zoning board. The two colored lots belong to Scott. Mr. Kuiti was contacted by F I Salter's realtor Natalie Hoff who showed interest in buying the sizable property. This was Scott's experience with Mrs. Hoff. The Piedmont Elementary school is Tim Grover’s baby. At the moment most of his neighbors in Piedmont Heights are very unhappy so much so that they are pulling their kids out of the Duluth schools in droves. Tim, as Chairman of the Board, is trying to protect what remains of the schools in his central western District. Highest on Tim’s list to save is Piedmont Elementary which has been hemorrhaging children. This is a story Let Duluth Vote has been attempting to get the Tribune to report for several months to no avail. Piedmont is a smaller school on a small parcel of land. Because the Red Plan envisions abandoning Lincoln Park both neighborhood’s children would be placed in Piedmont . Dr. Dixon wants a bigger site to accommodate a doubling of the school population. The District has, however, been rebuffed by two Piedmont churches although one of them may be willing to let the District vacate a street in front of it in return for a parking lot. This would require the acquisition of more homes. 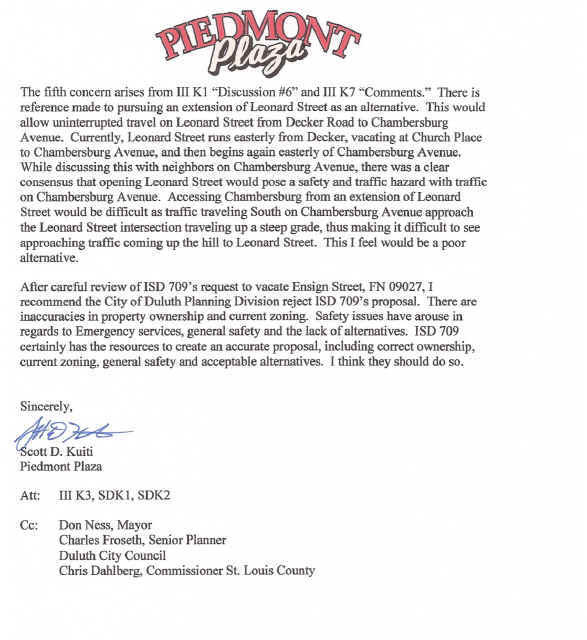 At last May's Zoning Appeals Board Mr. Kuiti objected to the street vacation. 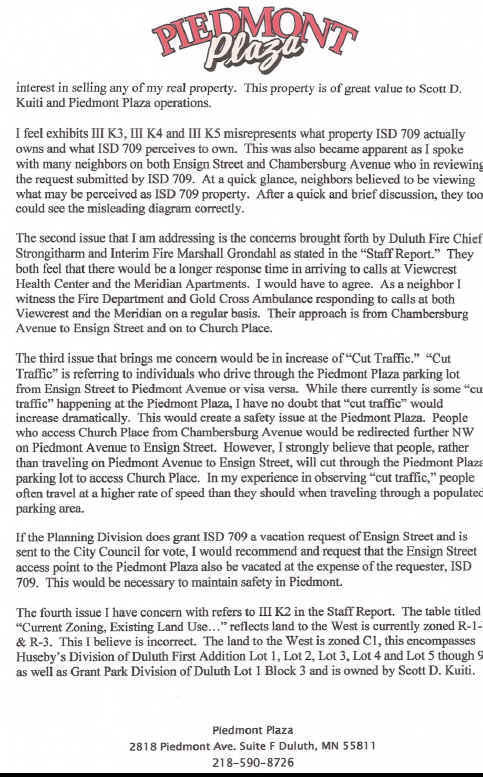 In addition to encouraging drivers to cut through his commercial property (which the District incorrectly labeled as residential) he noted that the Fire Department and Gold Cross Ambulance were concerned about a more circuitous route to the nearby Viewcrest Nursing home which gets a couple emergency calls each week. The Zoning Board tabled the District's request. Last year F I Salter’s realtor, Natalie Hoff, was working with school board member Grover to see if the Plaza Office Building could be purchased to expand the Piedmont site. She talked with Steve Kuiti who had recently plunked six figures into his office spaces. He would probably have sold his office building for the right price but would have done so reluctantly. Because the improvements made the property too expensive Hoff privately assured Kuiti that the District wouldn’t buy it. This took place about the same time that Kuiti was about to sign a new tenant. The evening that the rent contract was about to be inked and a check handed over Kuiti told the tenants that there was no rush and that he’d collect the check later. By coincidence the next day Kuiti's prospective buyer met Natalie Hoff at a social function the following day and mentioned that she was about to move into Kuiti’s property. “Why would you do that?” Hoff asked her. Hoff then explained that the property was about to be sold to the School District and torn down. Needless to say the prospective buyer was furious with Kuiti for not telling her this. Shortly afterward the angry tenant moved her business into the Village Mall a property managed by F.I. Salter. When Sarah Horner the Trib’s Education reporter began researching a story on the District’s acquisition of properties she talk to Kuiti. When he told Sarah Horner about his experience Sarah told him that he was making serious accusations. However, when she later found out that the District wasn’t going to buy his property she scrapped the story. At the last Regular School Board meeting Scott spoke to the Board and told them about the faulty property records. He demanded that the District write him a letter agreeing that it was not interested in his property to squelch rumors that were driving away prospective tenants. After the meeting Kerry Leider walked over with Natalie Hoff at his side to talk to Kuiti. Kerry agreed that the District had messed up and promised to work things out. Hoff pointedly asked Kuiti why he didn't spend some of his own money on a fix that Kuiti felt the District should remedy. Kuiti looked Hoff in the eye as he reiterated to Leider that he wanted a letter assuring potential Plaza renters that the District had no designs on his property. Hoff averted her gaze. 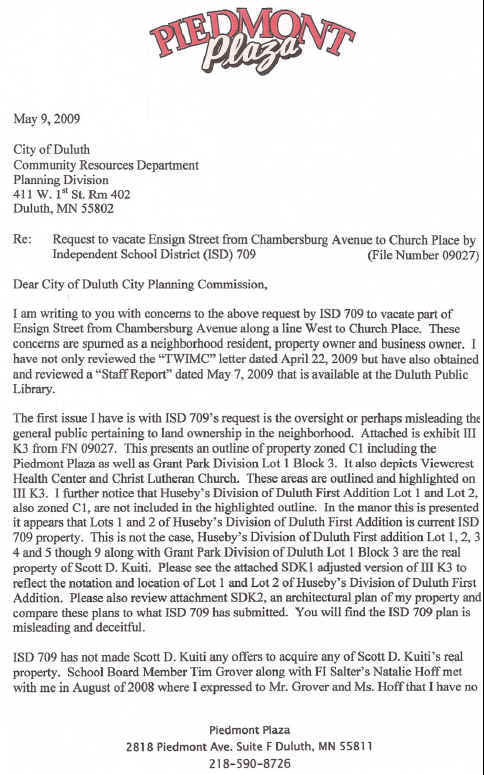 This is Kuiti's letter to the Duluth Zoning Appeals Board.